Give me a new home. 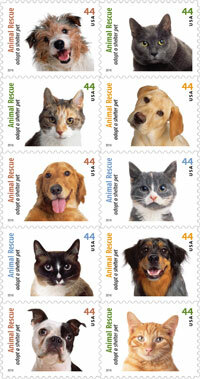 Stamps for pets. Next time you’re looking for a pet rescue one from a shelter. Many cats and dogs are available for adoption at your local animal shelter. These aren’t rejects, just animals looking for a forever home. 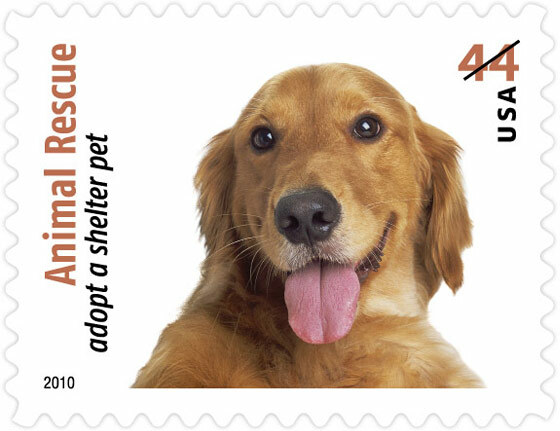 Ellen DeGeneres is teaming with the United States Postal Service (USPS) to publize the need for homes for these animals. The USPS is issuing a set of stamps on April 30, 2010 to give this a high profile. All the animals pictured are real rescued pets that have been given new homes. Ellen had Postmaster-General John Potter on her show recently to announce the program and the new stamps. 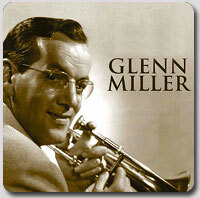 On December 15, 1944 Glenn Miller took off in a light plane from England to entertain troops in France. The weather at the time was atrocious and he was told to wait, but he said the troops needed him. He disappeared somewhere over the English Channel. No trace of him or his plane have ever been found. He was only 40 years old. 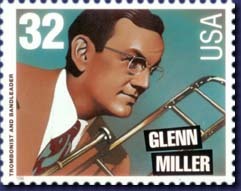 Glenn Miller was arguably the greatest Big Band leader of the era. His music was the anthem of the 1940’s. Girls swooned and men cheered his band’s sound. It was like rock and roll today. During the Second World War he and his band volunteered to travel to the war zone and entertain the troops. They also traveled all over the United States building morale and selling War Bonds. His story was told in the 1953 movie, “The Glenn Miller Story”, starring James Stewart. On this day in 1942 he was awarded the first ever Gold Record for selling 1.2 million copies of “Chattanooga Choo Choo”. Other great songs include, “In the Mood”, “Moonlight Serenade”, and “Pennsylvania 6-5000”. The United States Postal Service issued a stamp in 1996 honoring him. It is shown below. Maurice Sendak is an Jewish-American writer and illustrator born June 10, 1928 in Brooklyn, New York. He both wrote and illustrated the book. It was published in 1963 and became an immediate hit. The story received the Caldecott prize for Most Distinguished American Picture book for children in 1964. Sendak’s books are somewhat controversial because of his drawings and subject matter, but the kids eat it up. “Where the Wild Things Are” is now a major motion picture. In 1966 the United States Postal Service issued a set of stamps for the best children’s books. His story was one of the stamps. Sendak’s “Little Bear” stories are now a TV series and appear on Treehouse TV here in Canada. Sendak is still living and is now 81. He helped write the screenplay for this movie. One of the rarest and most popular U.S. stamps was sold at auction November 14, 2007 for a whooping $850,000 plus 15% buyers premium for total of $970,000!! This was one of the famous 24c U.S airmail stamps issued in 1918. Yes that’s right the face value was 24c which was actually quite expensive in those days. There was only ever one sheet of 100 of these stamps, the inverted error, sold to the public. The post office did find some others but they were defaced and then shredded to prevent profiteering. I won’t go into the complete story because a book and many articles have been written which detail its fascinating history. The sale catalogue (sale #946A) has wonderful write-ups on the history or the invert error by Scott R. Trepel (“The Allure of the Inverted Jenny”) and a great introduction by Joe R. Kirker ((“…and my heart stood still”). The catalogue can be downloaded in PDF format. Airmail Speeds the Mail, snail mail that is! 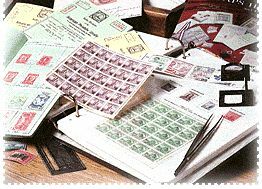 Last night I was working on an exhibit that I have entered in an airmail philatelic exhibition coming up in October. I thought I would try to explain the fascination with the collection of airmail material to non-collectors. First of all a definition. Simply put “Airmail” or “Air Mail” is mail that is carried to its destination by aircraft. Obviously this is faster than by truck or train. It was one of the great innovations of mail delivery which was made possible by the invention of the airplane. Until recently airmail was a premium service of the post office and the user paid more for it. 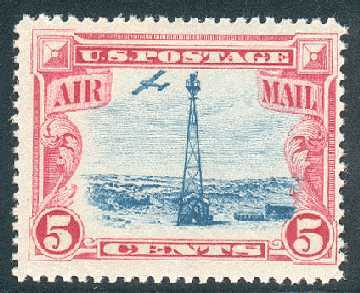 Special airmail postage stamps were issued to indicated payment for this service. These stamps were only allowed to be used on airmail, not for other mail. Later on that changed. The first regular airmail flights in the U.S. began between New York City and Washington, D.C. in 1918. The planes were operated by Army pilots. Later the government contracted the routes out to private contractors. Some famous aviators who carried mail were Charles Lindbergh, Wiley Post and Amelia Earhart. Early commercial airline routes were really paid for by the carriage of mail. There were not enough passengers to pay for the airlines expenses. Even today mail is a lucrative cargo for airlines. Passengers do take precedence today though. If weight is an issue the first thing off the plane is not passengers or their baggage, but mail bags. Today in Canada and the United States airmail has been abolished as a separate service. All first class (lettermail) mail is delivered by the speediest method of transportation. International letters are charged a premium for airmail service, but it is still technically not an airmail service. Both countries charge substantially more for international lettermail than domestic lettermail. Collectors have always been fascinated with mail and aviation. So much so that specialist societies exist dedicated to the pursuit of airmail stamps and covers (envelopes). One such society is the American Air Mail Society. For the first time ever the American Philatelic Society (APS) is hosting an exhibition that is entirely airmail related. It is called Aerophilately 2007 and has been given “World Series of Philately” status. This means that it has national level judging and standards. The grand award winner is entitled to compete against the award winners of all the other WSP shows. It is being held October 19-21, 2007 at the APS headquarters in Bellefonte, PA. Coincidently, Bellefonte was one of the mail refueling stations along the first trans-continental airmail route in the United States. My exhibit is entered in this exhibition and I am very proud to have mine displayed alongside some of the greatest airmail collections of our time. 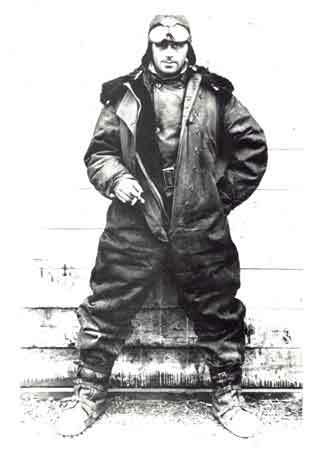 Above: Early airmail pilot “Wild Bill” Hopson. – messages were carried prior to airplanes by homing pigeons. – first mail to be carried by an air vehicle was January 7, 1785 on a balloon flight from England to France. – first official airmail delivery in the U.S. took place August 17, 1859 via balloon from Lafayette, Indiana to New York City. Weather forced him to land and the mail was carried by train to its final destination. – first official airmail flight was February 18, 1911 in India. 6,500 letters were carried a distance of 13 km (7.8 miles). – first international airmail delivery flown by Theodoro Fels from Buenos Aires, Argentina to Montevideo, Uruguay on September 2, 1917. -first airmail flight in Canada was June 24, 1918 from Montreal to Toronto. – first woman to fly airmail: Katherine Stinson from Calgary to Edmonton, Alberta, Canada on July 9, 1918. – regularly scheduled transcontinental U.S airmail flights begin in 1924. – In 1927 regular international airmail flights begin. – Trans-Pacific airmail begins in 1935. – In 1939, Canada implements regular trans-Canada and trans-Atlantic airmail. So remember when you mail that letter that today it flies to overseas destinations in hours. Before air transport it went by train or ship and took days or weeks to arrive. Of course now it is possible to send an e-mail letter to someone anywhere in the world and it will arrive in seconds. The only thing about an e-mail is that it doesn’t have a colorful airmail stamp on it that I can collect. Another of my interests besides writing is philately. What the heck is that many of you will wonder. Well it is the collecting of stamps and postal history. In a couple of weeks I am off to Portland, Oregon to attend the annual convention and show of the American Philatelic Society (APS). The American Philatelic Society founded in 1886 is the largest nonprofit society in the world for stamp collectors. APS has 44,000+ members in over 110 countries. Membership benefits include a subscription to “The American Philatelist” (monthly magazine), ability to buy and sell stamps in their on-line StampStore, insurance for collections, and access to their American Philatelic Research Library. Just being a member gives opens doors with dealers and others because it means you are a reputable collector or dealer. APS requires references as part of their application process. The show and convention is held annually at various locations in the United States. Usually it is held in the eastern U.S because that’s where the biggest population base is. This year it is relatively close to me, so I am taking the opportunity to attend. I am also exhibiting one of my collections at the show. 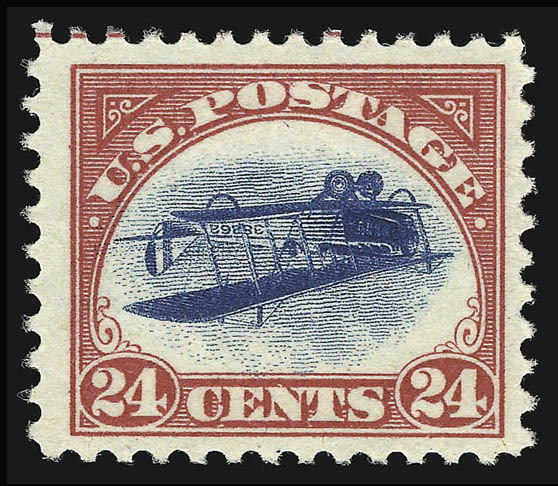 – unique block of four of the “Inverted Jenny” U.S. airmail stamp. This was sold at auction last year for 2.7 million US dollars. Other rarities from the Smithsonian will also be on display. The Inverted Jenny is presently owned by Donald Sunderland of Mystic Stamp Company. Beginners and youth are especially welcome and there are many programs geared to them. You are currently browsing the archives for the stamps category.